Below is a screen-cap of part of a video where a proof using conditional introduction is shown, which is proving under certain assumptions that given A is true, then the adjacent sentence is also true. I think I am misinterpreting the proof, as it would seem to be implying that under the assumption of B is true, and knowing A is true, then B implies A is true, but this can't be right. Surely B and A can both be true without B entailing A. 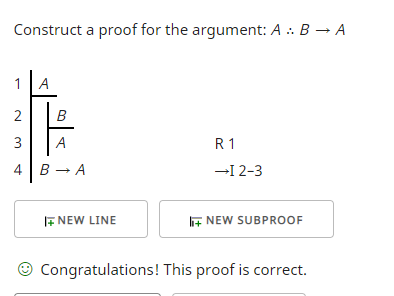 So how does the proof work? The OP raises the following question about the implication A ∴ B → A. 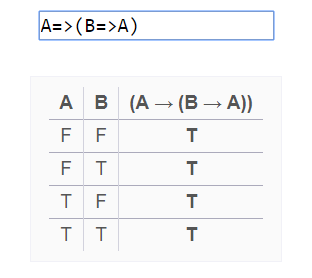 The fourth line in that table shows what happens to the implication when both A and B are true. Here the reiteration (R) rule on line 3 allows us to copy A from line 1 to line 3. 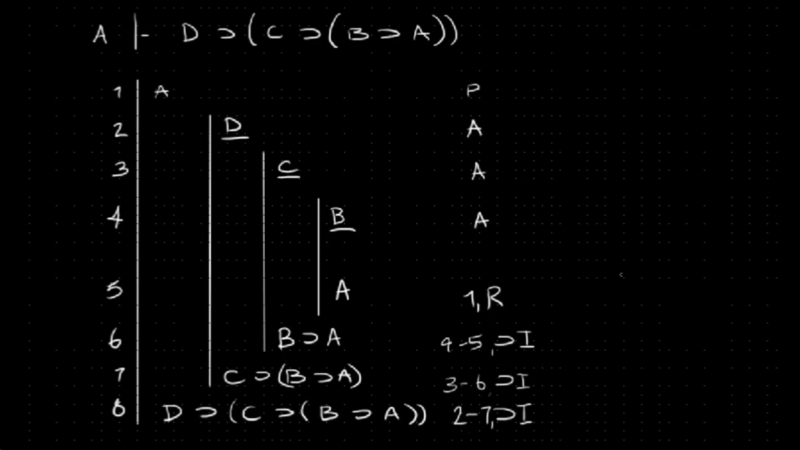 One can then rewrite lines 2 and 3 as a conditional using the rule of conditional introduction (→I). What makes this work is a truth predicate that assigns a true or false value to each of the sentences symbolized as letters. Couple that with inference rules and one has a truth-functional logic. Follow the rules and trust the symbolization can be assigned a truth predicate and the logic flows without considering what it is one is talking about. When we are promised that something is true, then it will still be true under any assumption. When something is true under an assumption then we may discharge that assumption to deduce a conditional statement that holds under all other assumptions. Not the answer you're looking for? Browse other questions tagged logic proof or ask your own question. How to deal with ¬∃ (negated existential quantifier) in a proof? Prove (P → Q) ↔ (¬Q → ¬P) using conditional elimination and negation introduction. Is it really problematic for Universal Instantiation to precede Existential Instantiation?